Seven88 West Midtown, a new residential tower now under construction, offers a unique option for discerning home buyers in the Atlanta condo market. The development features 22 well-designed floor plans in studio, one-, two-, and three-bedroom options, as well as penthouse residences. Owners can customize and elevate their living spaces through the selection of one of three interior design packages featuring rich, designer-selected finishes that are intuitively appointed. Seven88’s interior design is handled exclusively by Crosby Design Group, an Atlanta-based full-service interior design firm known for creating inspired commercial and residential spaces. The team at Crosby Design Group made all finish selections to fit with the modern yet timeless architecture of Seven88 West Midtown, while providing an elegant backdrop for each owner to add their personal style to the space. The interior design selections offer a simple, clean aesthetic and textures such as wood flooring, quartz countertops and concrete accents. Seven 88 West Midtown’s interior design concept and document implementation was led by Samantha Dillon. She was inspired by the west Atlanta district’s unique combination of modern, industrial and urban vibe. Crosby Design Group incorporated this design intent with the finish selections while complementing the architectural features of the building. Buyers at Seven88 West Midtown will have three modern, curated interior finish options to choose from. Similarities exist among the different interior design options, with each scheme offering European-style flat-panel cabinetry extending to the ceiling, white quartz countertops, oversized islands that have quartz waterfall edge countertops, and KitchenAid stainless steel appliances including a gas range with convection oven, full-sized dishwasher, and 36-inch French-door bottom freezer refrigerator. Bathrooms are distinctly appointed with durable Kohler plumbing fixtures and timeless porcelain wall tile to create a spa-inspired retreat. Backlit mirrors in each bathroom over the sinks and a separate glass shower in the master bath complete the luxurious look and feel. 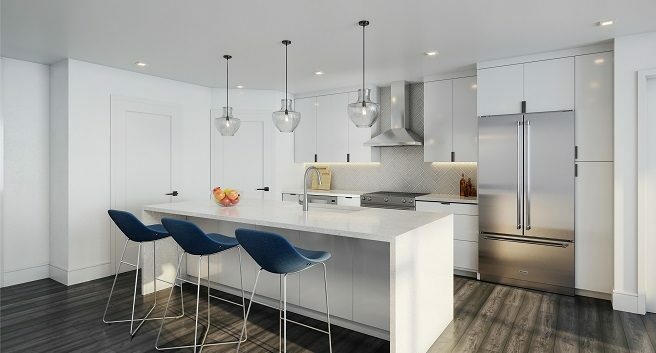 Additional design features available only to penthouse buyers include a 36-inch gas range with Vent-A-Hood, an undercounter glass front wine cooler, three-sided modern fireplace and gorgeous freestanding bathtubs with floor-mounted faucets. Featuring refined white and gray tones with light wood flooring, the first interior design package includes modern, high gloss European-style flat panel kitchen cabinets to the kitchen ceiling. Soft gray lower cabinets are paired with white upper cabinets, which are joined by a crisp white beveled subway tile backsplash. Industrial elements that match the history of Seven88’s West Midtown location are added using matte black cabinet hardware and silver dome pendant lights over the island. The nearly all-white color scheme continues in the bathroom with light gray cabinets and clean, simply stated white porcelain floor tile. This package offers similar tones to the Scheme A package, but provides distinct detail differences. The second package includes all white modern, high gloss European-style flat panel kitchen cabinets with a herringbone patterned tile backsplash. The lighting above the kitchen island is more refined in this selections package, with the pendants featuring a beautiful shaped glass globes with Edison lamps. In addition, the wood flooring throughout the home is darker adding contrast to the crisp white color pallet, while the large bathroom floor tiles are light gray. The final option is comprised of attractive moody tones that provide a stronger modern industrial vibe. The lower European-style flat panel kitchen cabinets are featured in a charcoal onyx color tone with white upper high gloss cabinets with the same door style. An extra feature is a unique tile backsplash that is reminiscent of wet concrete. Glass globe pendant lights suspend above the island in a dark finish that compliments the light gray wood floors that are featured throughout. The black cabinetry finish extends into the bathrooms where they accentuate a dark gray tile floor. The 279 residences and penthouses at Seven88 West Midtown are priced from the mid-$300,000s to $1 million-plus. 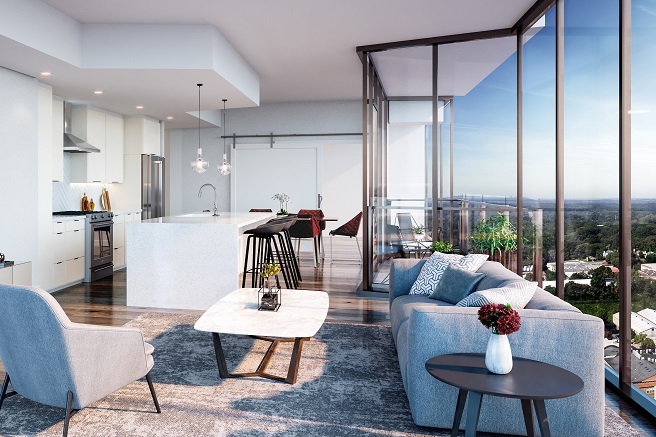 Each home is airy and filled with natural light while offering far-reaching, dramatic city views thanks to a superb location and oversized floor-to-ceiling windows. Every interior design selection was carefully hand-picked by the team at Crosby Design Group to ensure it complemented without overpowering one of the building’s primary features – it’s incredible, unobstructed views of Atlanta. Seven88 West Midtown, the tallest high-rise development in West Midtown, is a smartly-designed 20-story residential tower in the middle of an urban utopia. A well-appointed building with resort-style, luxurious amenities and curated interiors, Seven88 has 279 residences with customizable finishes and dramatic city views. For more information and sales opportunities, visit www.788WestMidtown.com. Crosby Design Group is a full-service interior design firm specialized in commercial, mixed-use, multifamily and large residential development projects. Established in 2000, the firm has remained loyal to its mission of creating inspired interiors on every project. With two office studios located in Atlanta, Crosby Design Group serves local and regional clients from initial conception, construction document production to executing their turn-key furniture procurement services. The name Crosby Design Group has become synonymous with producing creative, fresh, one-of-a-kind projects. For more information, visit crosbydesigngroup.com.